Document acknowledges serious failings; points to "decisive progress"
Vatican City, 20 March 2012 (VIS) – Given below is a note released this morning by the Holy See Press Office concerning the summary of the findings of the Apostolic Visitation in Ireland. It is, the English-language text reads, “a synthesis of the results of the Visitations to the four archdioceses, to religious institutes and to the Irish seminaries. It has been approved by the offices which conducted the Visitation and it also contains some further observations from the Holy See, in addition to those that the individual dicasteries communicated to the leaders of the respective archdioceses or institutes. “(a) The Holy See reiterates the sense of dismay expressed by Pope Benedict XVI in his Letter to the Catholics of Ireland and the closeness that he has often manifested towards the victims of these sinful and criminal acts committed by priests and religious. “(b) The Visitation, which was pastoral in nature, was able on the one hand to acknowledge the seriousness of the shortcomings that gave rise, in the past, not least on the part of various bishops and religious superiors, to an inadequate understanding of and reaction to the terrible phenomenon of the abuse of minors. On the other hand, it is clearly pointed out that, beginning in the 1990s, decisive progress has been made, leading to a greater awareness of the problem and profound changes in the way of addressing it. It is recommended that bishops and religious superiors keep up their commitment to welcoming and supporting victims of abuse. “(c) The guidelines contained in the 2008 document Safeguarding Children (which supersedes earlier documents) envisage: far-reaching involvement of the lay faithful and of ecclesiastical structures in the work of prevention and formation, close cooperation with civil authorities in swift reporting of accusations, and constant reference to the Congregation for the Doctrine of the Faith in matters that pertain to its competence. These norms have proved to be an effective instrument for handling accusations of abuse and for increasing the awareness of the entire Christian community in the area of child protection. 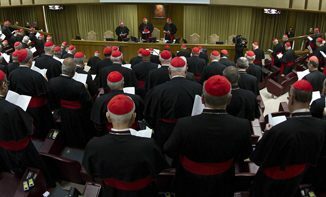 The Guidelines are to be further updated on the basis of the Circular Letter published by the Congregation for the Doctrine of the Faith on 3 May 2011, and periodically reviewed. “(d) The work of the National Board for Safeguarding Children is thorough and far-reaching. Of particular value is its auditing of the implementation of the guidelines in individual dioceses and religious institutes. It is recommended that this auditing process be extended as soon as possible to all the dioceses and religious institutes and that it be regularly repeated. “(e) On the basis of the recently published document Interim Guidance, bishops and religious superiors, in cooperation with the National Board, will have to formulate norms for handling cases of priests or religious who have been accused, but in whose case the Director of Public Prosecutions has decided not to proceed. Similarly, norms should be established for facilitating the return to ministry of falsely accused priests, and for ensuring that proper pastoral attention is given to priests or religious who are found guilty of abuse of minors. “(f) The Visitation to the seminaries was able to appreciate the commitment of the formators and the seminarians, and the attention given to intellectual, human and spiritual formation. In the seminaries, clear child protection norms are in place, with a broad understanding of all that this involves for the life of the Church. In order to improve the quality of the formation, it has been recommended, among other things, to ensure that it is rooted in authentic priestly identity, to reinforce the structures of episcopal governance over the seminaries, to introduce more consistent admissions criteria, to ensure that the seminarians are housed in buildings reserved for their exclusive use, and to include in the academic programme in-depth formation on matters of child protection. “(g) Each religious institute is invited to design a three-year programme for focusing anew on the founding charism and on the fundamental sources, developing adequate means for revitalising individual communities in the areas of prayer, community life and apostolic mission. The institutes are invited to develop a collaborative ministerial outreach towards those who suffer the consequences of abuse. “(h) The Visitation recognised that the painful events of recent years have also opened many wounds within the Catholic community. On the other hand, this time of trial has also brought to light the continuing vitality of the Irish people’s faith. Among the signs of hope are the dedication with which many bishops, priests and religious live out their vocation, the human and spiritual bonds that many of them have observed among the lay faithful at a time of crisis, the deep faith of many men and women and a remarkable level of involvement among priests, religious and lay faithful in the structures of child protection. In this context, a renewed call to communion is made – communion among the bishops themselves and with the Successor of Peter, communion between bishops and priests, between pastors and laypersons, between diocesan structures and communities of consecrated life. “(i) Finally, certain pastoral priorities are mentioned which may help to guide renewal: formation in the content of the faith, a new appreciation of the commitment of the laity, the role of teachers of religion, openness to the contribution offered by movements and associations, and fidelity to the teachings of the Magisterium. It is stated, moreover, that the Holy See and the Irish bishops have already initiated a joint reflection on the present configuration of dioceses in Ireland, with a view to adapting diocesan structures to make them better suited to the present-day mission of the Church in Ireland”.